Dean Karnazes, an American ultramarathon runner, best-selling author of “Ultramarathon Man: Confessions of an All Night Runner” and motivational speaker used to be an ordinary beer-guzzling guy who became sick of dealing with the rat race of life. One day, while celebrating his 30th birthday with his friends at a bar, unexpectedly he took a decision to come out of the boredom of life and went on for a 30-mile run. His childhood passion for running transformed his life. While in school, he would come home directly running, would cycle 40 miles to his grandparents’ home without his parents’ conscience. He even ended up winning the one-mile California State Long-Distance Championship that was held on the Mt SAC track. He was also awarded as the “Most Inspirational” team member for his courage and believing “run with your heart”. Unfortunately he was not compatible with his high school track coach and stopped running almost for fifteen years until his 30th birthday. Dean often runs beyond endurance and far distances, even in dangerous and hostile weather conditions environments. It includes running 146 miles nonstop in the extreme heat of 120-degree of notorious Death Valley as well as the 40–below temperatures of the South Pole. 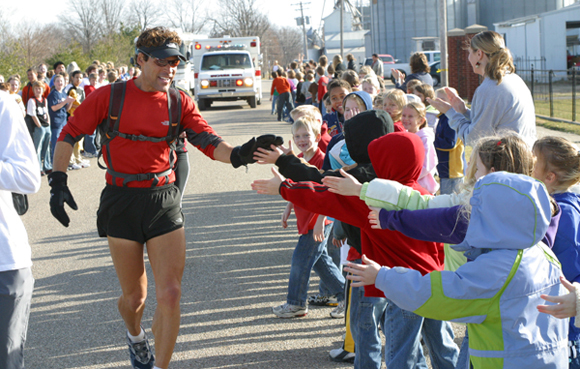 His achievements include his nonstop running for over 80 hours and 44 minutes in 2005, and finishing 50 marathons in 50 states in 50 days in 2006 and returning 1,300 miles back to the start after finishing. In 2011, he completed 3,000 miles across the United States from Disneyland to New York City with 75 days. He has been featured in Time Magazine’s ‘100 most influential people in the world.’ His accomplishments inspires millions of people across the world. In his book, “Ultramarathon Man: Confessions of an All Night Runner” he gave lessons on how to push your body and mind to inconceivable limits, and explains his epic journey, the secret of mega endurance running, mental strength and courage for the general public.